This week was our home tournament, with teams visiting from Falkirk, Livingston, Watsonians and Edinburgh Accies. 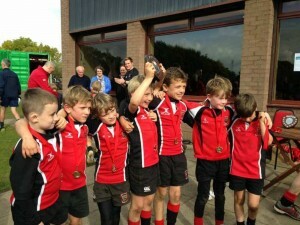 The plan had been to field three P4 Linlithgow teams. However at the last minute Forrester were unable to get together a team, therefore the decision was taken to put out a fourth Linlithgow team to ensure two even pools. That meant there were 28 kids across the four teams representing Linlithgow – a terrific achievement and testament to the dedication of all of their parents bringing the boys along each week – well done to all! 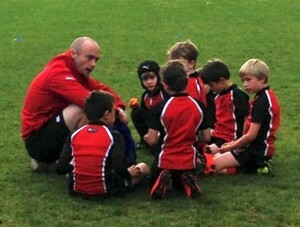 At this age group we have moved into ‘contact’ rugby with tackling and limited rucking being introduced. These are difficult skills for some of the boys to pick up, and they are doing extremely well. What we learned today, was that they can be difficult skills for coaches to pick up as well! Throughout the games we saw tackles above the waist, rucks with piles of bodies involved, some running with a ball in one hand and at one point a maul that the South African national team would have been proud of! This is perhaps to be expected though as we all get used to the new rules and the boys get up to speed with their techniques in contact. We will definitely see a tightening in the adherence to the rules as we go forward. With that in mind, throughout the season we have worked hard to encourage strong tackling below the waist, to defend in a line and when they have the ball to run straight and strong and look to offload the ball quickly when they are tackled. When they get these basics right, our lads are fantastic to watch and play great attacking rugby with some fantastic handling skills. We will continue to work with them on these skills and this type of game, whilst also introducing rucking in the coming weeks. On to the games… I won’t go through every game, but suffice to say that all of the Linlithgow teams acquitted themselves well today. The players were split evenly across all of our four teams and that meant that all were competitive and able to play a strong game. The pools ran their course and at the end Falkirk topped Pool A and Linlithgow Tigers topped Pool B. The final was a pretty fierce affair with bodies being put on the line, bumps and bruises being picked up and a vocal crowd shouting support for both teams. The Linlithgow boys played exactly like they had done all day, all seven of them tackled hard in defence and supported each other in attack, meaning they could pop the ball quickly and move the point of attack away from the tackle area, thus keeping moving forward. This proved vital in the end, with the Linlithgow Tigers running out as winners by 4 tries to 2 from Falkirk. Today, the whole squad should be proud of themselves – we have the skills to beat any team we have come across this year, and the only aspect the boys have to improve upon from today is to show determination in adversity. We are used to playing well and being ahead in games, when we slip behind we need to work on keeping our heads in the game and getting back into it – after all 10 minutes is a long time in these games and we can always score tries. If that sounds doom and gloom to finish on, it shouldn’t. It’s one of only a small handful of learning points for the boys from today and we continue to be delighted to see how well our guys play at tournaments.